Sunday, Nov. 4, 5pm, at English Lutheran, 1509 King St., La Crosse. In response to the mass shooting on Oct. 27 at Tree of Life Synagogue in Pittsburgh, PA, the Interfaith Leaders’ Coalition is organizing a community, inter-faith prayer vigil. There will be six different faith traditions sharing candle light, scripture, a few thoughts, prayer and hymns. The La Crosse Central Robed Choir will provide special music. The Butter Braid fundraiser ENDS THIS SUNDAY, Nov. 4. All order forms, with the money, must be turned in to the church office. Orders will be available for pick-up on Wednesday, Nov. 14, after 12pm. If you have questions, please contact jason@firstlu.org. Starting Wednesday, Nov. 7. Peer Ministry is a great way for our 10th-graders to learn about how to deal with any situation that arises, large or small. It makes handling conflicts simple and equips them to be better listeners and be welcoming to those around them. Meeting most Wednesdays from 7-8:30pm at the house. This high-energy retreat is filled with music, faith-building time and fall activities! Cost: $85 (includes 5 meals). 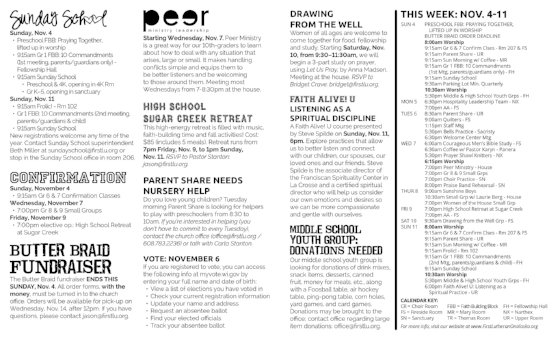 Retreat runs from 7pm Friday, Nov. 9, to 1pm Sunday, Nov. 11. RSVP to Pastor Stanton: jason@firstlu.org. Do you love young children? Tuesday morning Parent Share is looking for helpers to play with preschoolers from 8:30 to 10am. If you’re interested in helping (you don’t have to commit to every Tuesday), contact the church office (office@firstlu.org / 608.783.2236) or talk with Carla Stanton. Women of all ages are welcome to come together for food, fellowship and study. Starting Saturday, Nov. 10, from 9:30–11:30am, we will begin a 3-part study on prayer, using Let Us Pray, by Anna Madsen. Meeting at the house. RSVP to Bridget Crave: bridget@firstlu.org. Our middle school youth group is looking for donations of drink mixes, snack items, desserts, canned fruit, money for meals, etc., along with a Foosball table, air hockey table, ping-pong table, corn holes, yard games, and card games. Donations may be brought to the office; contact office regarding large item donations: office@firstlu.org. Middle & high school youth groups gather weekly on Sundays. Starting at 5:30pm all ages eat together in Fellowship Hall, and then break off into their groups for fun, fellowship & devos. Questions? Contact Pastor Stanton, jason@firstlu.org. Monday, Nov. 12, 6pm, Cameron Hall of Nations, 1300 Centennial, UWL. Free & open to the public; come hear Dr. Louise Cainkar from Marquette University. This talk focuses on why some aspects of American culture promote Islamophobia, including through its history and media portrayal of Muslim populations around the world. It also looks at the harmful impacts of Islamophobia on American men, women, and youth. We invite all retail workers in our area to join us on Sunday, Nov. 18, for worship and a special blessing as they prepare for the upcoming demands of the holiday season. In place of our usual worship on Wednesday, Nov. 21, members of First are invited to join in a special, ecumenical worship service on that Thanksgiving Eve at 7pm, at Onalaska United Methodist, 212 4th Ave. N.
This year’s Community Thanksgiving Dinner will be on Thursday, Nov. 22, from 11am–2pm at the Onalaska Armory. The Onalaska Rotaries are organizing the event this year and are looking for volunteers and donations. To make a monetary donation, send checks (made out to OEF) to: Onalaska Enhancement Foundation, Thanksgiving dinner, 415 Main St., Onalaska, WI 54650. Advent is a season full of rich traditions for both home and church. We invite all members of First Lutheran to join us on Sunday, Nov. 25, at 9:15am in Fellowship Hall for our annual Advent Around the Table event. We will create advent wreaths for our homes, chrismons for our trees, and advent calendars to help us keep the days of Advent. Along the way, we will learn more about this particular season, have great fellowship and grow in our faith as we kick off the Advent season. Tuesday, Nov. 27, 12:30-5:30pm. Every day ordinary people are saved by some pretty extraordinary people. People who give blood. Your donation could be the most valuable gift you ever give. Just ask anyone who’s ever received. Walk-ins welcome; appointments encouraged, schedule yours at 1stlu.org/blooddrive. Please bring a photo ID. A baptism preparation session will be Saturday, Dec.1 , at 10am in the narthex for anyone who is considering or has scheduled a baptism. To register or ask questions, contact the church office: 608.783.2236 / office@firstlu.org. Winter is coming, and that means the Teen Clothes Closet will be giving out more hoodies, winter coats, gloves, hats and warm scarves. New or gently-used (smoke free) donations are appreciated, and can be dropped off in the First Lutheran entry way. Also, we need a heavy-duty clothes rack for winter coats, room dividers to create additional changing areas, and small old-fashioned travel cases or trunks to use as decoration. If you have any of these items to donate, please contact the church office. Other needs: toothbrushes, floss, colored jeans for girls (sizes XS). Thank you! With your support, we have served nearly 100 teens since moving into our new locations!